It’s 8am on a spring morning in Southeast Portland in the year 2020. Roberto is ten years old. His mom hands him his lunch as he scampers out the back door and down the alley towards Arleta School from his home on Boise and 66th. With the exception of crossing Foster, Roberto can make it from his door to the school grounds without ever hitting a busy street. Even on Foster, a raised and guarded crosswalk makes it safe to cross traffic. Two of his friends see him from the front window of their accessory dwelling units and scramble out to join him on his walk to school. Down Lupine Alley between 65th and 66th streets, Roberto watches the ambiance change as he makes his way through the alleys. 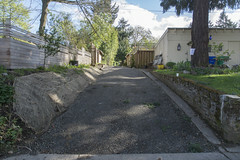 Residents have given each alley a character and style that reflects their needs and interests. He likes the one between Boise and Holgate because it has a playset and apple trees. The cafés have expanded into the alley as he watches business people getting morning coffee, reading the paper, or meeting for an early chat in the sanctuary provided by the alley. He hops along the cobbled surface, oblivious to the way the alleys used to be. Instead, he enjoys the art, flowers, green walls, benches, and natural environment. Crossing Foster, the alleys change. Now there’s artwork and murals covering the fences. Bigger kids are heading to school as well, skateboards slung as they walk along the stone path. He passes the garden plots and produce beds with signs saying to “take what you need and share the rest.” Sometimes he grabs a carrot for a snack. The alleys are another game for him and the children now, like a labyrinth that lets them explore the neighborhood. But they have other uses, too. 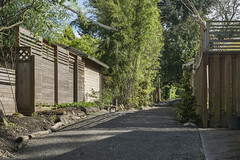 Cars still amble through to get to garages, although many have been converted to attractive accessory dwelling units, providing a new source of housing for many and income for longer-term residents. 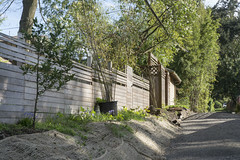 Businesses along Foster were quick to see the potential of the alleys, and now there is a busy market of construction and landscaping companies competing for jobs redeveloping the alleys in Northeast Portland. Far from the underutilized spaces they once were, alleys have become a source of pride, cohesion and community that is unique to the neighborhoods along Foster Road. They have set an example for alley communities everywhere, with projects popping up in cities throughout the country.